Akari Taiyo is a gifted Tarot card reader, able to accurately predict the future by laying out her cards and interpreting them. She inherited this skill from her mother, and possibly something more – Akari is one of twenty-two chosen girls to harness the powers of the major arcana in order to fight daemonia, monsters who take advantage of peoples' emotions in order to consume them and wreak havoc. For most of the girls, this is just a battle, but Akari can hear the voices of the people the daemonia have taken over. Can she bring herself to fight when she knows that each monster defeated means a person killed? How does one describe sole penetra le illusioni ~ Day Break Illusion? It would be easy to write it off as either a moe show or a Puella Magi Madoka Magica ripoff, and in some ways both of those things are true. However, Daybreak Illusion is also a fairly thoughtful entry into the magical girl genre, making interesting use of the major arcana from the Tarot deck and forcing its heroines to decide if fighting demons is worth it when you know someone's going to die. The main heroine of the show is Akari Taiyo. She lives with relatives and is, like her late mother, an exceptionally gifted fortune teller. Before she becomes aware of her ability to wield the sun card from the Tarot deck as a weapon, the only unusual thing Akari notices about herself is that plants seem to flourish in her presence, making a jungle of her bedroom. One day, however, terrible things begin to happen in both her home and her workplace. She has what she thinks is a dream about a plant monster attacking her and suddenly uses the sun card to transform into a flame-haired version of herself. Her cousin seems to be controlling it, and Akari uses a sword pulled from the card to run her through. When she wakes, however, it turns out that not only was it not a dream and her cousin really is dead, but also that no one seems to remember that her cousin ever existed. This, it turns out, is Akari's first encounter with the creatures known as “daemonia,” evil beings that take over a person who is suffering somehow and use them to commit horrible acts. Akari is, she learns, one of twenty-two chosen girls who can each use one of the cards of the major arcana to fight daemonia. 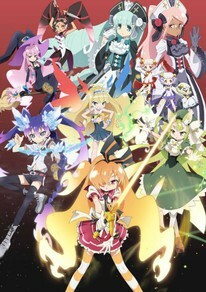 She quickly transfers to a special school, where she is put on a team with three other magical girls – Seira (the star), Luna (the moon), and Ginka (temperance). It soon turns out that Akari has a special power that none of the others possess – she can hear the voices of those consumed by the daemonia, and thus is fully aware of the monsters as the people they once were. At first this seems like a bit of a gimmick. Akari is, essentially, the magical girl version of the kid with shinigami eyes who pops up like a weed in supernatural-themed anime and manga. As the show goes on, however, Akari's talent becomes a sort of metaphor for gaining closure after a tragedy, something that is used quite well in both episodes five and six, where people the other girls on her team know are possessed by the monsters. Akari, we realize, never really knew what was going on when she fought her cousin. She didn't understand that she was killing her, and now that no one else remembers she ever existed, there is no way for her to fully come to terms with what happened and her role in it. This is best seen in episode six, when skeptical and harsh Seira is forced to undergo a similar experience, as well as to deal with her tragic past. She is able to find closure because of Akari's ability in a way that Akari herself cannot. It will be interesting to see how and if this power will ever benefit Akari directly in the second half of the show, as right now she is the only character on her team who has not received solace from it. For everything that Daybreak Illusion does right and well there are some elements that don't quite work. Episode one feels rushed and really requires the other five to fully understand, which is fine in retrospect but doesn't do a terrific job at hooking the viewers. The inclusion of two heterochromatic talking animals doesn't seem to do much beyond providing the show with talking animals, and efforts to make Ginka cutely quirky just sort of come off as weird. Some of the ways that the cards manifest themselves in the girls' outfits are also a bit odd, such as Luna's animal ears when she's transformed. Are they rabbit ears for the Japanese myth of the rabbit on the moon? Are they wolf ears in reference to werewolves transforming by moonlight? Why does Temperance fight with money – is it to show the evils of not being temperate? Surely it has more meaning than simply that found in Ginka's backstory...? Some other aspects of the art don't quite work either, such as the fact that Akari looks as though she has a lobster claw on the side of her head or the width of the faces when compared with the bodies. Luckily other artistic choices are much better, such as the bright colors, pre-and-post transformation subtlties, and the clockwork and jigsaw puzzle backgrounds against which the girls fight. Even more impressive is what is not shown – at times viewers are forced to imagine things for themselves, which undoubtedly makes a few scenes more gruesome than anything the animators could have shown us. Daybreak Illusion isn't quite a Madoka imitator, but neither is it wholly original. It isn't totally moe, nor does it totally shy away from the tropes of that genre. It isn't phenomenal, but it does pack a punch when you're not expecting it. It is neither here nor there. There are definitely moments of greatness to be found, and episodes five and six being the strongest certainly indicates that it is upping its game. It just may turn out that Daybreak Illusion is a dark horse of a show and will leave us all gasping at its finale. Right now, however, it is a bit of an odd duck, combining predictability with moments of heart-wrenching melancholy. + Akari's power as a metaphor for closure is interesting and effective, most of the Tarot stuff is accurate. Some very powerful moments, and the way the girls' emotions are tied to their transformations is nice. − Some elements feel a bit predictable, the head-to-body proportions can be too much at times. Characters all fit neatly into types, the triplets and the talking animals feel overdone.